LiveAdmins instantly connects you with your website visitors. We help you make your customer’s journey a memorable one from the moment they land on your website. We answer travel queries round the clock on your behalf, proactively engaging online visitors and offering guidance on the best available deals and offers. This makes it more likely for online visitors to purchase the plans or packages offered by your business. Our Live Chat service is offered in 4 languages so you can cater to a wider audience. Our technology seamlessly integrates with your CRM software so customer and revenue management is never an issue. Our agents help every customer on your website and provide them with the information they are looking for in a matter of seconds. As soon as there is a new reservation request, our system will automatically send an alert to your smartphone or email. We help you promote special offers with an easy-to-set-up banner so every visitor gets to see it as soon as they land on your website. Our ICR system distributes chats based on agent availability, language settings and level of training so visitors always get the best experience. Some of our leading clients are from the Travel Industry. In 2016, we achieved 83% customer satisfaction with a zero hold time for our clients. Is the Live Chat support available in any other language apart from English? We offer chat support in 4 global languages including English, French, Arabic, and Spanish, to cover a wide range of markets all across the world. Will the passengers be answered regarding their travel enquires? Yes, our agents will have the knowledge to efficiently answer passenger queries regarding flight status, booking information, price plans and latest offers. On which devices does live chat work? Be it a desktop, tablet or mobile – our chat windows are fully responsive thereby delivering optimum visitor experience on every platform. Do you provide 24/7 chat service? Absolutely. We ensure that our customers are provided with 24/7 chat support without any interruptions, delays or lags, all year long so your customers will never have to wait. 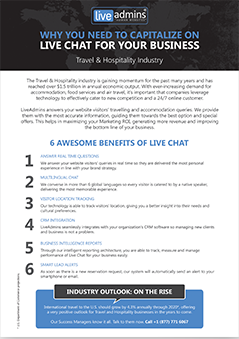 Fill out this form now to see how our solutions can make a difference to your travel industry.